In this episode of Uncork Your Mind I talk with Courtney Quinn of Our World Our Community importer of wines from Uruguay and Argentina. Like many people, Courtney didn’t begin her career in the wine industry. She actually worked in the not for profit sector and wanted to make a career change. All it took was a trip to Napa and she knew the wine industry was for her. She went home and enrolled in San Diego State Business in Wine program. Then quit job, sold house and moved to Napa and studied at CIA Greystone in their wine immersion program. Now that she had some wine education she needed to decide what to do and where to go with it. When talking to people one thing was constant they kept telling her “Have you thought of Mendoza Argentina” she thought this was sign and she packed up and went to Mendoza. One thing she realized very fast is she needed to learn Spanish. So she enrolled in a Spanish class, and spent the mornings in class and the afternoon scouting out vineyards. wines of Uruguay tasting. She was very impressed with Bodegas Carrau’s Tannat and Sauvignon Blanc and the rest is history. Courtney sees her growth in the South American market. At the moment she only imports to California, but wants to expand to other western states. She wants to focus on other producers in Argentina, Chile and Brazil. Listen to the podcast below as Courtney talks about the wines she imports and the history behind the wineries. 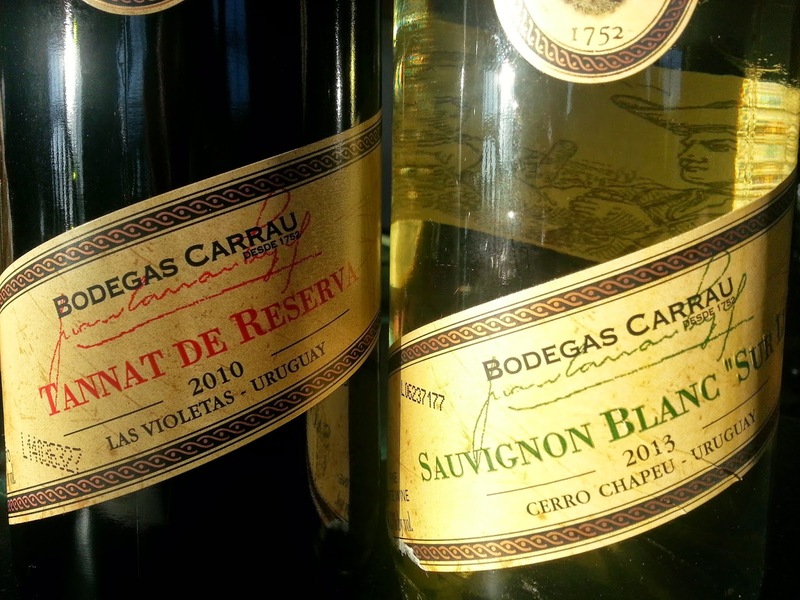 There are only 230 wineries in Uruguay and Bodegas Carrau has two different vineyards , one in the southern part of the country and one in the northern part of the country. The Sauvignon Blanc is from northern vineyard in the Cerro Chapeau region which is a continental climate at an elevation of 1000ft. The highest vineyard in the country. Down in the southern part the Las Violetas region has a maritime climate. This vineyard has the influence from Atlantic ocean. Two very different terriors, two vineyards, one winery. The only gravity flow winery in Uruguay. 2013 Bodegas CarrauSauvignon Blanc Sur Lie – Amazing! Aromas of passion fruit and fresh citrus just pouring out of the bottle. Nice soft acidity with hints of lime. 2010 Bodegas Carrau Tannat Reserva – Aromas of black cherry,oak and vanilla. Plums and hints of raspberries on the palate with soft tannins. I paired this with Paul’s Chicken Marsala and it was a great pairing.